To start, let’s explore the Scene Builder. [This will go into detail – if you’re already a subscribed member, try the tool now]. 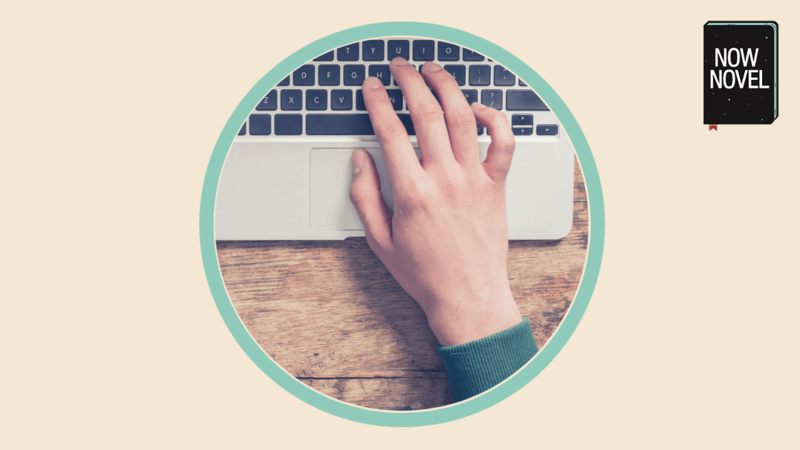 Members’ feedback indicated many loved the step-by-step prompts in our story dashboard. (We improved the parts members didn’t love as much in the last update to our writing tools). ‘I have the first few chapters but I can’t work out how the pieces of my story fit together’. Use the new Scene Builder to create this fit. When you open the Scene Builder in your private dashboard, you come to the ‘Scene Overview’ tab. 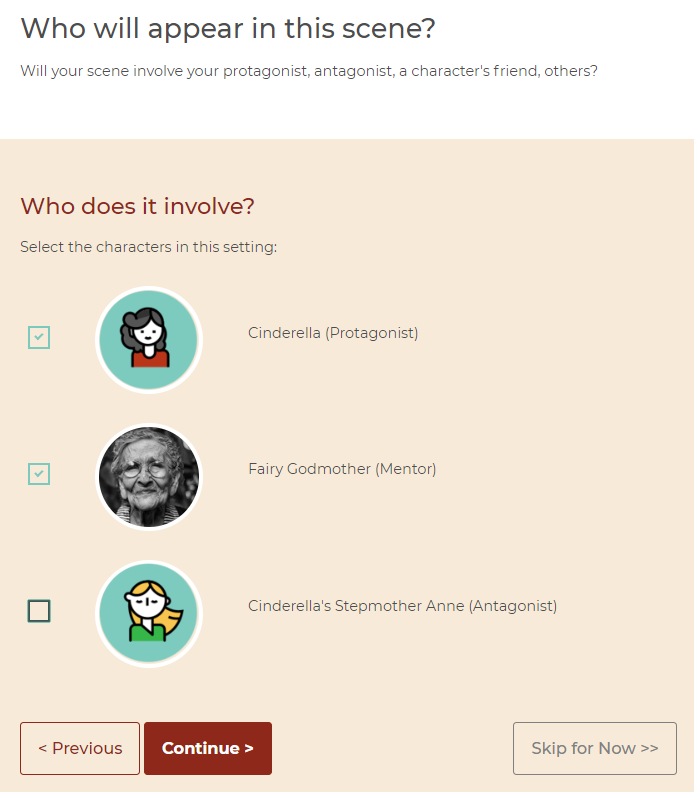 Choose ‘add new scene’ and give a story-driven title (e.g. For the classic story ‘Cinderella’, ‘The News of the Ball’). You’ll be prompted to add further details (though these only show in the edit flow and in your outline – the overview page gives a summary view for clarity and structure). 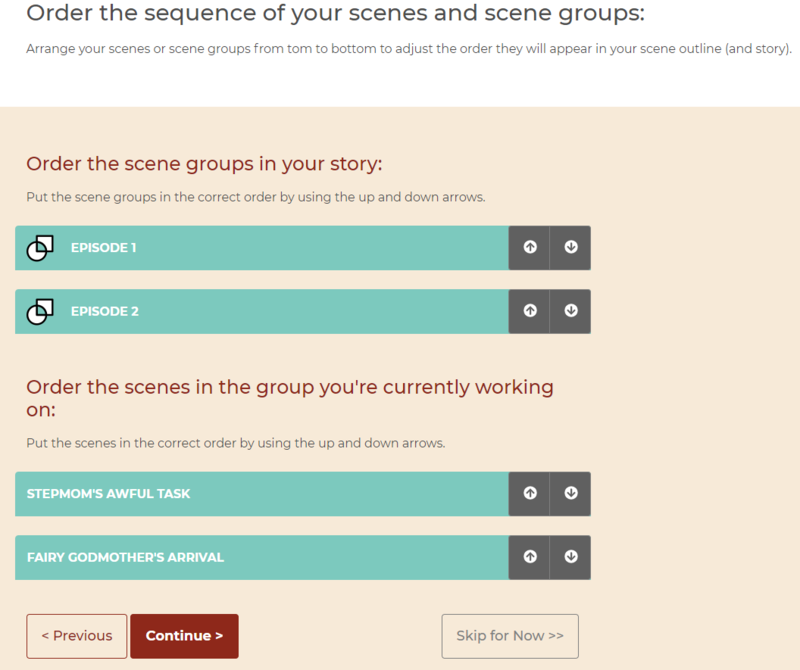 Each scene summary you create is added to the overview page. Here you see a list of scenes you’ve outlined. You see their titles, and – most importantly – their role or purpose in your story, if you’ve filled in this step. This is the ‘so what’ of your plot. A summary of why each scene matters. It’s automatically added to the story outline you can download from your dashboard. Whenever you add a new scene, this adds a summary to ‘Ungrouped Scenes’ on the overview page. Create groups of scenes using the ‘Add New Scene Group’ button. 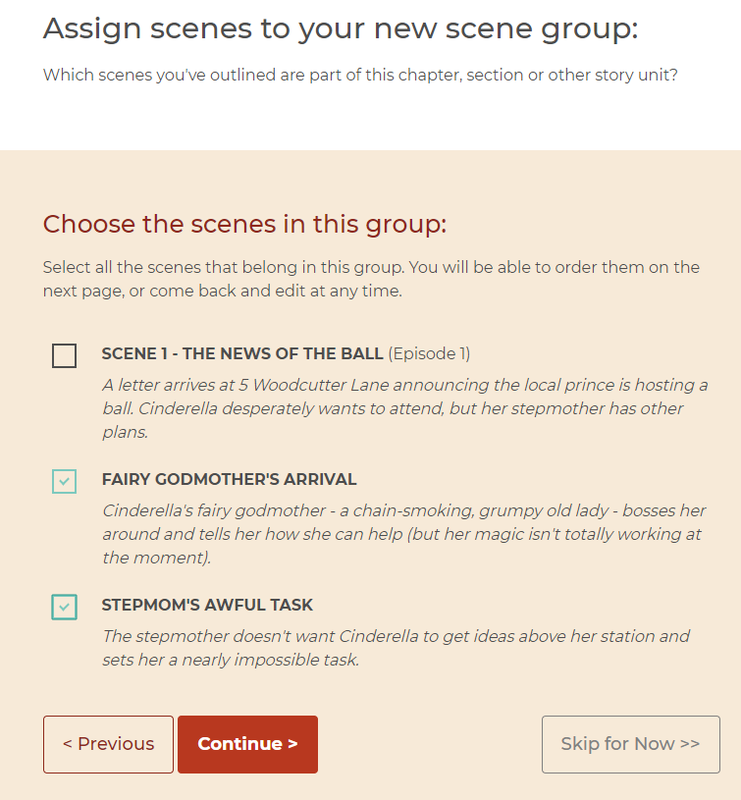 You can order the sequence of scenes you’ve assigned to your group, as well as episodes or chapters. You’re thus free to outline scene or chapter ideas out of order and later arrange them in the order you want. We’ve used the term ‘scene group’ as you could arrange scenes in chapters, acts, parts of a novel (e.g. ‘Prologue’, ‘Main Events’, ‘Epilogue’), or even episodes (if you’re writing a screenplay, for example). Writing is a funny thing. We don’t always think of scenes in linear sequence. Sometimes an idea for a scene somewhere in the middle of your story just pops into your head. Use the scene builder to get these events down. Find their order when you’re ready to group them into units. Or create chapters as you go – it’s up to you. Say, for example, you want to include the Cinderella scene where her fairy Godmother helps her prepare for the ball. You decide you also need to show the cruel stepmother setting Cinderella an impossible task. The task creates stakes – whether or not Cinderella will finish in time to attend the ball. If you decide to delete a scene at any point from a group, it won’t affect the flow of your other episodes and scenes. If you delete an entire group (such as Episode 2 above), the scenes in that group will return to the ‘Ungrouped Scenes’ list. All of these details are automatically added to your outline, so you have a comprehensive overview of where scenes take place and who they involve. 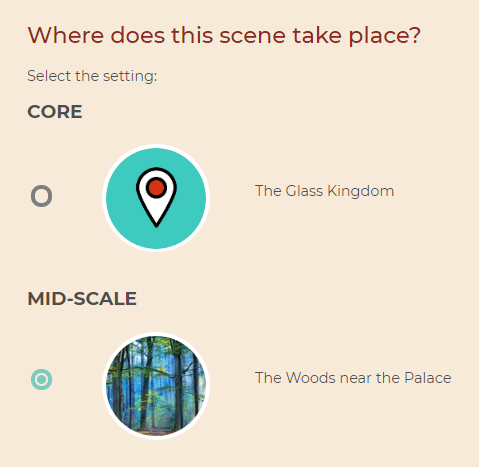 Moving on to the World Builder tool, we’ve created a tool to supplement ‘core setting’ and enable you to invent whole, complex worlds containing individual countries, cities and streets, or simply jot down a few story locations. You can go into as little or as much detail as you like. For example, if you were writing an espionage novel set across two US cities, you could create two mid-scale settings, naming one after each and fleshing out any visual, cultural or other details relevant to your story. On the overview page, choose between three options. Choose the first, ‘Add Large-scale Setting’, if you want to brainstorm facts about a whole world, country or other large area. Click the second (‘Add Mid-scale Setting’) if you want to brainstorm details of a city, town, Kingdom or other smaller region. And choose the third, ‘Add Small-scale setting’, if you want to find the look and feel of an individual story location. 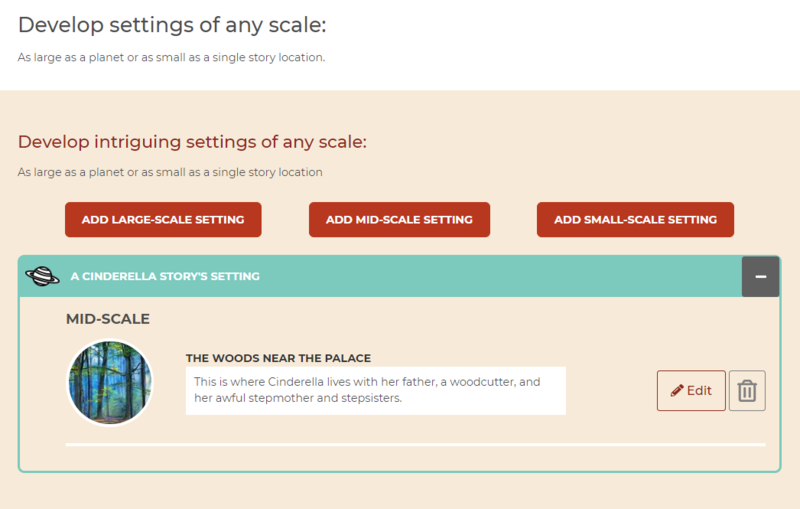 Link your setting ideas to capture where individual story settings lie within your larger world in your outline. This is particularly useful if you’re inventing an entire world for a fantasy or sci-fi novel. You could use this summary as an aid if you decide to draw a fantasy map. Yet you may want to brainstorm details about a country or state for a real-world setting, too. E.g. London (mid-scale) and the Tower Bridge (small-scale). 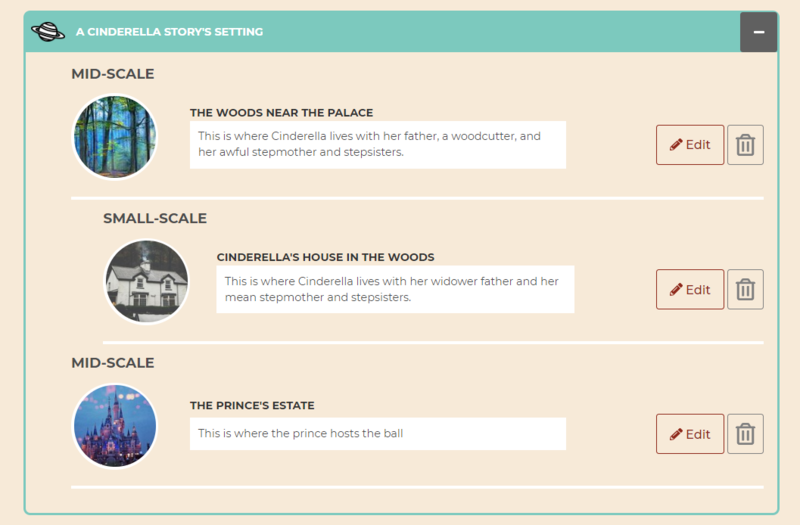 As with each of the other sections of the Now novel story dashboard, you can use the World Builder in as much or as little depth as you like. Remember, though, to click ‘continue’ when you finish a section before using the top navigation to go somewhere else. This saves your progress to the section and your outline! Any changes you make are applied to both automatically. 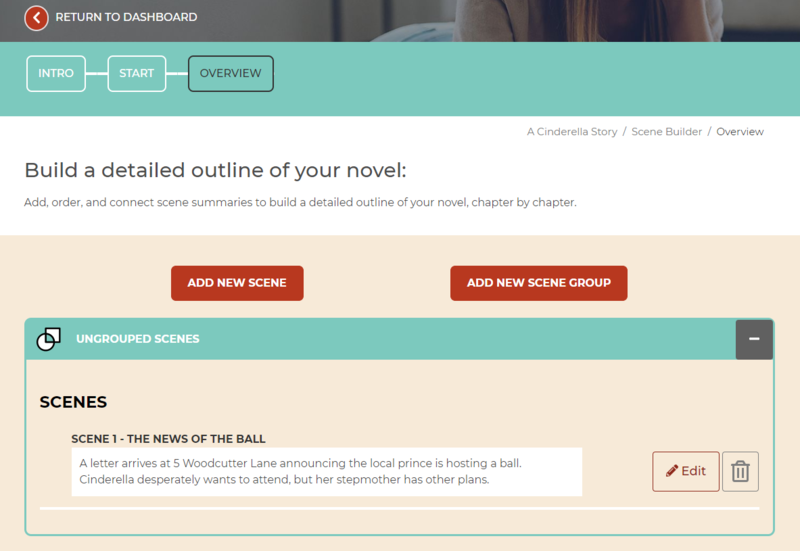 The Scene Builder and World Builder are fully incorporated into the private story outline you can download from your member dashboard. Each section shows in an overview/summary format first, then gives details scene by scene and setting by setting that you’ve brainstormed. This way, you have a structured guide to refer back to as you draft, or add more to as your story takes you to new, incredible destinations. Try the new tools now! (Requires Now Novel membership subscription – or try the ‘Central Idea’ and ‘Character’ sections of the tool first for free).